Pre-purchase a discounted voucher for a 1-hour Bow River Ride or a 2-hour Sundance Loop Ride in April, May and June 2019 and save 40%! Be quick – sale ends 31 May 2019. See the full terms and conditions. You’ll receive a unique coupon code redeemable to use until 30 June 2019, based on availability. When you are ready to select dates, simply apply your coupon code at checkout. Treat yourself to a relaxing Bow River 1 hour horseback ride that takes you past some of the most awe-evoking scenery in Banff National Park, including the tranquil Bow River and the historic Cave and Basin area. An extension of the Bow River Ride, our 2 hour Sundance Loop horseback ride explores stunning sections of Banff wilderness. After riding by the Bow River and the historic Cave and Basin area, you’ll climb Sulphur Mountain up to Windy Knoll. Vouchers are non refundable once purchased and the promotional value (40% off) ends 30 June 2019. The season dates that this offer applies to are 11 April – 30 June 2019 for the Bow River Ride and 26 April – 30 June 2019 for the Sundance Loop Ride, subject to availability and weather conditions. The amount paid never expires. Valid only for option purchased on regularly scheduled horseback trail rides and cannot be combined with any other offer. Bookings are required at least 48 hours in advance online or by phone. Our usual 48 hour change/cancellation policy applies to all bookings made with a coupon (groups of 9 or more people are subject to a 7 day change/cancellation policy). All horseback riders must be 8 years or older, and a maximum of 250lbs. Please refer to the full list of restrictions. Got a question about what to wear, where to meet or other tour details? Check out the full details for the Bow River Ride and the Sundance Loop Ride. 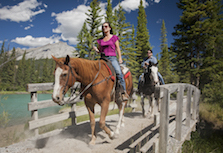 Both rides depart from Warner Stables on Sundance Road in Banff – a five minute drive from downtown Banff. Want to speak with a real person before purchasing your voucher? Phone us on 1800-661-8352.